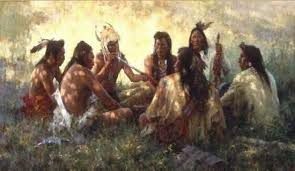 Those who desire to benefit their spiritual path by learning Native American knowledge and wisdom, some of which will come through the ceremonies, are recommended to get a Cannupa (pronounced Cha-New-Pa) or sacred pipe. The Cannupa is not restricted to only Indians. It has been jealously guarded by Native Americans, however, because many are fearful that the pipe may be used disrespectfully by non-Indian people. Many believe that a powerful good for all things can emanate from the respectful and proper use of the pipe, but it must be regarded as a spiritual instrument by the pipe holder, whatever their lineage or color happens to be. The pipe can become a strong catalyst to import a powerful feeling for our Mother Earth and all living things. The ceremonial use of the Cannupa is a simple ritual. The Cannupa serves as a portable altar. It is loaded with tobacco, and only tobacco, or a tobacco variation called kinnick kinnick, which is the bark of the red willow and non-hallucinatory. The bark of the red willow has a pleasant aroma, and served in the old days as a substitute, when tobacco was scarce on the great plains. No form of mind-altering substance is condoned by Native American religion traditionalists. Unfortunately, peyote, a mind altering cactus bud , is wrongfully associated with traditional Native American religion and ceremony. The True Native American Way finds the Great Spirit through “our own juices” (fasting, knowledge and observances of God’s creation and the Sun Dance, Vision Quest, and Sweat Lodge ceremonies). We do not need or use hallucinating substances. This is an example of an Indian prayer beginning with the east. On looking participants will also face east while the pipe is loaded in such a manner. The pipe holder turns to the south and points the pipe stem in that direction. A new pinch of tobacco is held slightly above eye level in a southerly direction. On looking participants face south. A note regarding prayer or acknowledgement; Indian people memorize few prayers or acknowledgements. Rote prayers are not recommended. The Our Father, common to Christians, would be considered too lengthy a recital to be memorized by traditional laypeople. Sioux holy men, holy women, and medicine people do chant lengthy songs and prayers in a prescribed manner for certain ceremonies. But, by and large, Indian prayers flow from the heart. A prescribed symbology is followed, especially in regard to the four directions. Knowledge in relationship to the east, growth from the south, and so forth are included, but rote prayers are not generally followed. In a Sweat Lodge Ceremony, the pipe is smoked following the ceremony, after the participants emerge from the lodge. The ceremony ends in the smoking of the Cannupa. Usually the participants will change into dry clothing, before they gather in a circle to smoke the Cannupa. After this last ritual, the participants can then partake of a meal, which is a general custom following an evening sweat that is not a preparatory ceremony for a Vision Quest or the Sun Dance. When a Cannupa is loaded indoors, a woman will usually serve as acceptor for the tobacco that is normally sprinkled unto Mother Earth. The woman represents the White Buffalo Calf Woman and will take the accumulation of tobacco offered to the four directions, Mother Earth, Father Sky, and the Great Spirit outside at some later time and sprinkle the tobacco upon the earth.